Why would a patient choose Breast Conservation Therapy (BCT)? Numerous published reports indicate that patients with early-stage breast cancer who choose the lumpectomy option followed by a full course of radiation therapy that includes a boost dose, have as good a chance as those electing mastectomy for overall or cancer-free survival while preserving their breast.10,11 That said, this is an important individual choice and a crucial discussion to have with your Radiation Oncologist. Why is a "boost" dose necessary with External Beam Radiation Therapy? How will I decide between Accelerated Treatment (APBI) and External Beam Radiation Therapy? This is an important question to ask your radiation oncologist as part of the overall assessment of your cancer and the preferred treatment regimen for you as an individual. The doctor, nurses, and counselors will help you with that decision process. It is important to bear in mind your own lifestyle preferences and educate yourself on all the options. Learn more about the AccuBoost for APBI or Boost here. 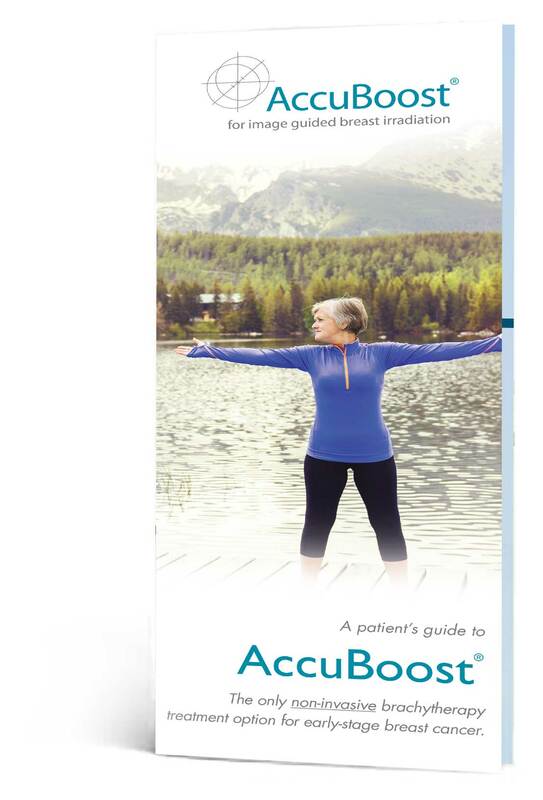 Why might AccuBoost Treatment be the right choice? What makes the AccuBoost Technique different from other Boost or APBI delivery techniques? Is it safe for me to be around my loved ones throughout my course of treatment? The lumpectomy site is exposed to radiation only during the visit to the hospital. No traces of radioactivity are present anywhere in or on the patient after the session is over. The patient is free to follow a routine social life without the fear of causing harm or contaminating others. Radiation boost with image guidance to target the dose are accepted procedures for the treatment of breast cancer and are covered by most plans. The same is true for APBI techniques. Specific coverage for the AccuBoost Technique will depend on your individual healthcare plan. Is the AccuBoost breast cancer treatment going to hurt? Patient comfort is extremely important. Every effort will be made by your treatment staff to make you as comfortable as possible during treatment. The pressure applied to your breast will typically be a fraction of that from a typical mammogram as the goal is simply to hold the breast still (immobilize), not to compress. As with most post-operative breast radiation treatments, you should still be able to drive after you are treated. That said, every patient experience is different, and you should check with your caregiver if your particular circumstances indicate you should not. Is there anything going into my breast? The AccuBoost Technique is 100% non-invasive. There are a number of breast radiation therapy techniques that require an invasive device or catheters inserted into the breast to deliver treatment. The AccuBoost Technique does not! How long will my treatment take each day? On a daily basis, most treatment centers will book a 30-minute time slot for Boost treatment and a 60-minute time slot for APBI. In either case, only a portion of this time is involved in the actual delivery of treatment. The exact length of your treatment depends on specifics of the treatment your doctor delivers. How many days will I be treated with AccuBoost? If you are being treated with APBI, your treatment will take 5-10 days depending on the specifics of the options chosen by your radiation oncologist. Alternately, if you are receiving a “Boost” dose, that can range from 2-10 days, but most patients experience 4-8 days. Can I continue to work during treatment? This is a very important question. Many patients are able to continue working during therapy without interruption. Your medical team will provide guidance about what lifestyle modifications you may or may not need to take. Will I get a skin reaction? It is important for patients to be their own advocates and discuss any concerns with your radiation oncologist to potential skin reactions or related side effects.